I have both happy and sad news to share. When will I ever get out of this clinic? You can go, thanks for bringing him home! I need some monkey love! Let's take a look at those teeth! I think I will just take it slow and easy for now! On the sad side... I am very sorry to tell you that we have recently suffered two losses. On March 5, Howard, one of our elderly squirrel monkeys, passed away. He was fine in the morning and came to breakfast; a few hours later, he was found in his outdoor habitat with his eyes closed and unmoving; he looked very peaceful. Howard was at least 25 years old; he was captured in the rainforest as a youngster and spent nearly two decades in laboratory research, until he was retired to Jungle Friends Primate Sanctuary on August 19, 2004. I remember the day I first met Howard, when I visited the lab negotiating his release - I am so happy that we succeeded and Howard was able to spend his golden years at Jungle Friends. I feel privileged to have known Howard; I sure will miss that little guy and his famous peanut dance! Now, just a few weeks later, my heart is aching again with the loss of another dear soul. Thursday morning, Marvin left us. He was an elderly monkey who was diagnosed with cancer about 8 months ago. Marvin lived longer than the vets anticipated. Day before yesterday, Marvin did not come out when breakfast was being served. Ashlei called me when she found him curled up indoors and unresponsive. I could tell that he was ready to leave this life for the next. Lucy, Marvin's companion, was beside herself. She shrieked at us, letting us know that our intrusion was not welcome. I don't think Lucy wanted to share the little time she had left with Marvin with the likes of us, so we left them alone to say their goodbyes. Marvin and Lucy had so many good times together; they were such show-offs! Marvin would chase Lucy around and then Lucy in turn would chase him. They would climb the trees and swing on the ropes as easily as any of the younger monkeys -- the horrible abuse they both suffered was soon forgotten when they joined our Jungle Friends family. Lucy is actually taking Marvin's death better than I am. I know she will miss Marvin, but I don't think monkeys grieve as we humans do; they probably have a healthier way of dealing with death. We will all miss our old boys, but Marvin and Howard are now truly free. Please make a donation to the Laboratory Monkey Retirement Fund in memory of Howard and to our Memorial Medical Fund in memory of Marvin. Thank you in advance for your compassionate support! Your donations enable us to provide the best possible care for our special needs monkeys. We thank you for your generosity and compassion! 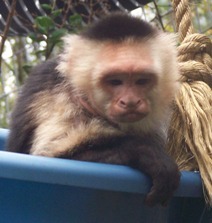 Darwin, who arrived at Jungle Friends last October, is having some very serious health issues. He started picking and biting at himself where he had an abrasion, which we thought had been caused by a spat between him and his companion, Dharma. As his condition worsened, we thought Darwin must be biting himself due to stress he was feeling from missing his human family of 13 years. However, our vets feel that he is suffering from neuropathy. This is a condition that causes your extremities to feel like they are filled with pins and needles. Darwin's humans, Patty and John, were here last Thursday to visit Darwin and Dharma. Patty told us that Darwin had bitten and picked at wounds in the past. Patty also said that when Darwin was very young he got himself wrapped up in a blanket which caused him some paralysis and resulted in nerve damage. We have Darwin on a drug regime that we hope will curb the pins-and-needles feeling and help calm him. If anyone has any insight into this condition, please let me know. We are very concerned for Darwin's health and well being. Our devoted carestaff is making sure that he is diligently and lovingly cared for. Someone is with Darwin before the sun rises until after the sun sets; he is never left alone until he goes to sleep at night. I am asking all of you to send your healing thoughts, and Patty and John ask you to keep Darwin in your prayers.